A new social media campaign against a law which forces women to wear a headscarf is gaining momentum in Iran. Using the hashtag #whitewednesdays, citizens have been posting pictures and videos of themselves wearing white headscarves or pieces of white clothing as symbols of protest. The idea is the brainchild of Masih Alinejad, founder of My Stealthy Freedom, an online movement opposed to the mandatory dress code. Before the 1979 Islamic revolution many Iranian women wore Western-style outfits, including miniskirts and short-sleeved tops, but this all changed when the late Ayatollah Khomeini came to power. Women were not only forced to cover their hair in line with a strict interpretation of Islamic law on modesty, but also to stop using make-up and to start wearing knee-length manteaus. More than 100,000 women and men took to the streets to protest against the law in 1979, and opposition to it has never gone away. 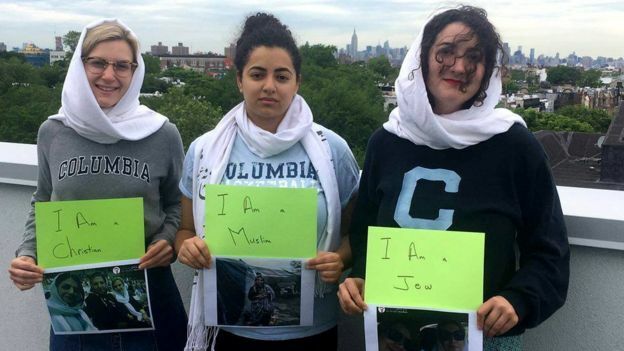 In the three years that it has been running, My Stealthy Freedom has received more than 3,000 photos and videos showing women without their heads covered. While pictures posted on My Stealthy Freedom sites are usually taken in secret to avoid being caught by the authorities, #whitewednesdays gives women a platform to demonstrate in public. 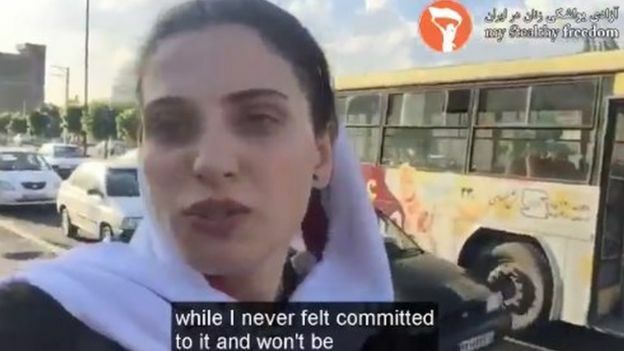 Now in its fifth week, #whitewednesdays has already attracted a considerable following - more than 200 videos were sent to Ms Alinejad in the first two weeks, some of which have already had 500,000 views. "I'm so pumped up to be in this campaign," one contributor says in a video as she walks down a main road. "I want to talk to you of my imprisonment... they imposed hijab on me since I was seven," she says, shaking her headscarf loose, "while I never felt committed to it and won't be." 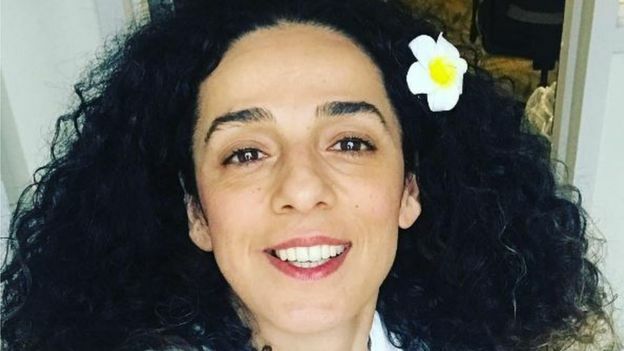 Ms Alinejad says she is amazed by the demonstrations of courage - some women have sent in videos of themselves walking the streets without headscarves altogether. "When I expressed my concern about [one contributor's] safety, she replied that she would rather jeopardise her job than continue living under this oppression that the Iranian women have endured for the last 38 years." For Ms Alinejad, the project is a labour of love. She runs the campaign herself, with occasional help from a small number of volunteers, and sometimes stays up all night getting the videos up online. Most of the pictures and videos come from inside Iran, but Ms Alinejad has also had contributions from Saudi Arabia (where the headscarf is also compulsory) and further afield, including Europe and the US. One woman in Afghanistan wrote about her admiration for the campaign and its participants, even though she herself was too frightened to post a photo without a hijab. Headscarves are not mandatory by law in Afghanistan, but many girls and women are forced by their families to wear them. Ms Alinejad says she is emancipating Iranian women, as well as the men who support them. One participant said it was important because "even if this leads me to jail and sleeping with cockroaches, it would be worth it to help the next generation". Ms Alinejad sees herself as helping, rather than heading, the campaign. Iranian women, she says, "are taking the lead themselves, they don't need me, they just needed a platform... and I provided them with that". Her actions have come at a cost though. Ms Alinejad, who lives in self-imposed exile in the US, has not been to Iran since 2009 and at the moment cannot go back to her home country for fear of arrest. Following this latest campaign, the chief editor of Iran's Tasnim news agency published a photo of Ms Alinejad with her husband, calling her a prostitute. Mashregh News, a website said to be affiliated with Iran's Islamic Revolutionary Guard Corps (IRGC), carried an old family photo of her with her mother, who wears a head-to-toe black chador, and her father. The caption says in bold: "Death to you Masih." Ms Alinejad is defiant, saying none of the backlash will stop her from fighting to win women back their freedom. 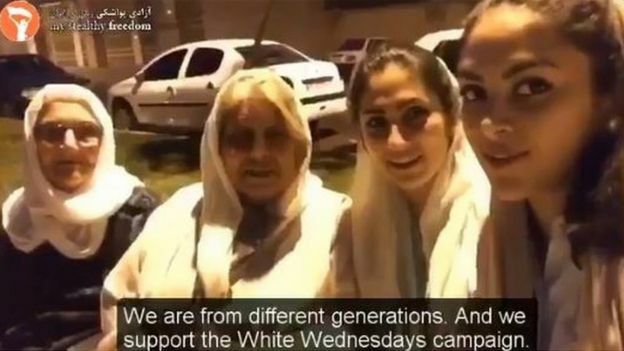 Her sights are now set on turning the campaign into a concerted global movement, where more women around the world identify with #whitewednesdays and make a simple fashion statement as a powerful show of support.